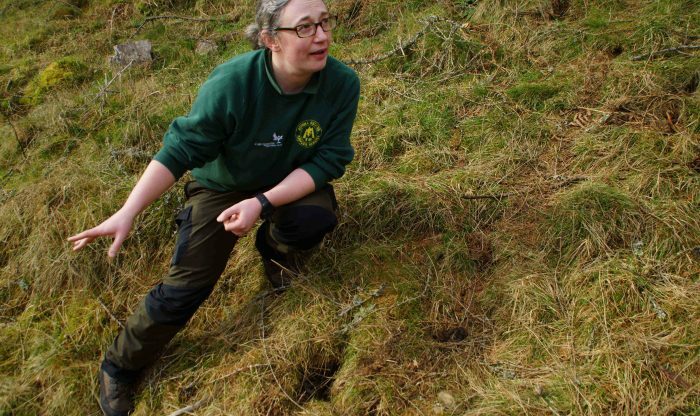 Julia Duncan, Atholl Estates Ranger, updates us on what will be happening over the next few months in the Highland Perthshire part of the Cairngorms National Park. My first seasonal ranger post covered part of the Cairngorms National Park and now, six years later, I am back in the Park. I’ve been in post here at Atholl Estates since July last year and, while I still have a huge amount to learn, I am loving every second. Rangers often say we love our jobs because the work is hugely varied and it is absolutely true. There is also a degree of seasonality too, and right now the Park is starting to burst into life again after winter. It is also the time that many of our wildlife monitoring projects kick off again, and one I am particularly looking forward to is black grouse monitoring. These take place over April and May and involve unobtrusively counting lekking (displaying) males. These incredible birds are a Priority Species in the UK Biodiversity Action Plan and we are lucky to have them in good numbers here at Atholl. The surveys involve an early start but it’s one of nature’s amazing spectacles and well worth getting out of bed for! As we move into the spring and summer seasons, it is important for a Ranger to be out and about as much as possible. It’s a great opportunity to meet visitors and help them to explore this amazing area, as well as to answer any questions they might have. We also run a series of outdoor events aimed at families including mini beast hunting, shelter building and this year a first for me – hapa zome – which is making natural art using hammers! I’m also looking forward to being part of the Cairngorms Nature Big Weekend. The Ranger Service also works closely with our forestry team, game department and home farm to keep visitors up to date with what’s going on and the teams, as well as many other estate departments, pitched in for the village’s annual litter pick recently. We collected almost fifty bags of rubbish and it was a great team effort. I also try and get round all our waymarked paths to ensure they’re litter free and I count us very lucky as, for the most part, they usually are. Trail checks are good for spotting any repair jobs that are needed – such as replacing waymarker posts or cutting back vegetation that is encroaching on the path. It’s also a great way to spot wildlife, especially now as our red squirrels are making the most of the slightly warmer days. I also heard a great spotted woodpecker drumming loudly this week – another sure sign that spring is just around the corner. The Ranger Service helps to run the Care for the Cairngorms Perthshire group which runs volunteer tasks – such as path maintenance or biological monitoring – every couple of months. We have also recently welcomed CNP Volunteer Rangers who will be pitching in with all kinds of tasks throughout the estate. You might bump into them on patrol if you’re visiting the estate too, so make sure you stop and say hi. The Ranger Service is also proud to be part of a Junior Ranger programme and work closely with S3 students from Pitlochry High School. They’re working towards a John Muir Award and are always willing to roll their sleeves up and have a go at whatever activities we dream up. I am hopeful that it will inspire them to consider a career in conservation too, as it is endlessly rewarding. Find out more about Atholl Estates here. Follow Atholl Estates and Julia on Twitter, Facebook and Instagram.